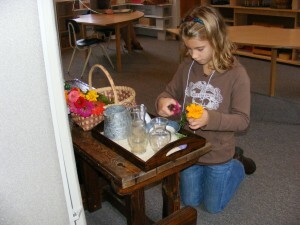 Flower arranging is a favorite work for children in the Level 2 atrium. Our Children’s Formation program – the Catechesis of the Good Shepherd – started a new year September 25. Children arrived to find the space had been changed around. The youngest children in Level 1 are now in their own room (once occupied by the oldest children). Levels 2 and 3 are in the big room, separated by dividers, but with a pass-through between so that the older children might access some of the materials from Level 2. This “porous-ness” is also an advantage for the adults who are with the children. We now have two catechists – one for Level 1 and one for Level 2 and 3. Laura Starr-Houghton is training for Level 2 and Laura Arvin is training for Level 3. If anyone is interested in beginning training, please see either of these women to express an interest. And, as always, if you would like to join us in the atrium to see what the children are up to, please come and see!